One of my favorite jewelry pieces is smooth teardrop (full drop) briolettes of any gemstones. Most gemstones are often faceted so that they sparkle when light falls. It's really hard to find quality smooth pieces. I love the smooth pieces as compared to the faceted ones as they clear bring out the quality of the stones. I prefer the clear ones to the translucent ones E.g. citrine, lemon quartz, amethyst etc. Here are some of my favorites on Etsy that I have been lusting for a while... Hope you love them too. 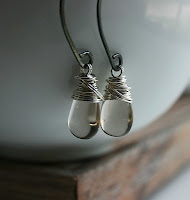 These smokey quartz earrings are really clear and matches perfectly with the oxidised silver hooks. 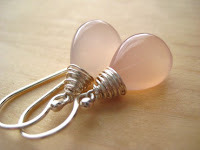 Love the consistent color of the rose quartz and can you see how amazingly neat are the wires wrappings! Perfect! 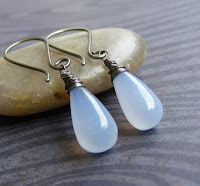 Love the teardrop shape and the beautiful color of Chalcedony. It's natural (not dyed) and it's AAA! I can never have enough earrings! These are lovely choices. I've never used smooth beads before, unless you count the seed beads I started on, and the round semi-precious ones I worked with before I became fascinated (facetated?) with Swarovski, and none were briolettes! The work you do with them is beautiful! Simply stunning, and beautifully elegant!